MPPT solar Charge Controller with real MPPT(max power point tracking) technology could increase 20-40% usage of your solar panels than PWM charge controller! Our Patented Programming could avoid puncture of Li ion battery PCBA when disconnect charger and Li-ion battery suddenly under full charging! We are the first one to bring the technology to solar charging to Li-ion! 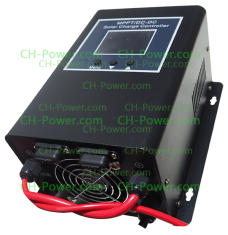 3rd generation MPPT Charge Controller 55A at selectable 48V/60V/72V/96V is with real MPPT(Max power ..
3rd generation MPPT Solar Charge Controller 30A 12V 24V 36V 48V is with real MPPT(Max power point tr..
3rd generation MPPT Charge Controller 30A at selectable 48V/60V/72V/96V is with real MPPT(Max power ..
3rd generation MPPT Charge Controller 65A at selectable 12V/24V/36V/48V is with real MPPT(Max power ..
3rd generation MPPT Solar Charge Controller 50A 12V/24V/36V/48V is with real MPPT(Max power point tr..